Without any awareness of quite how useless they are, the legacy media is currently giving a quite startling demonstration of their inability sensibly to report on Brexit issues. The occasion is the rather limited reporting of the evidence given by the car manufacturing industry to the Business, Energy and Industrial Strategy Committee in the House of Commons yesterday, where the accounts published completely miss the point. An example – which typifies the rest – is the account in the Guardian which, bizarrely, has Honda UK warning MPs of the consequences of leaving the customs union. This focuses on the supposedly "devastating impact of a hard Brexit on the UK car industry", where MPs "were told every 15 minutes of customs delays would cost some manufacturers up to £850,000 a year". Yet, right up front, we had something far more serious. Patrick Keating, Government Affairs Manager, Honda Motor Europe, gave evidence on the post-Brexit type approval situation, which will have a catastrophic effect – and apply whether we get a deal or not. Incredibly, this evidence, despite coming within the first ten minutes of the session, was almost totally ignored by the media, and barely acknowledged by the Committee. I don't suppose the situation was at all helped by having the questions led by Labour's Rachel Reeves, chairing the Committee. Seriously thick, with no light of intelligence shining in her eyes, she clearly had no comprehension of the EU's vehicle type approval system. Even when she had it explained to her, both by Keating and the wearily patient Mike Hawes, Chief Executive, Society for Motor Manufacturers and Traders, she showed no signs of understanding what she had been told. Most of the evidence sailed over her head. For all that, once the crucial points had been brought up right at the beginning of the evidence session, they should have dominated the inquiry. As Keating explained, the "real risk" to the car industry will be triggered not in the event of a "no deal", but "as the UK leaves the Single Market". When this happens, the type approvals issued by the VCA, the UK Vehicle Certification Authority, will either no longer hold validity or not be able to be extended. This technical jargon conceals a life-or death issue for the industry. 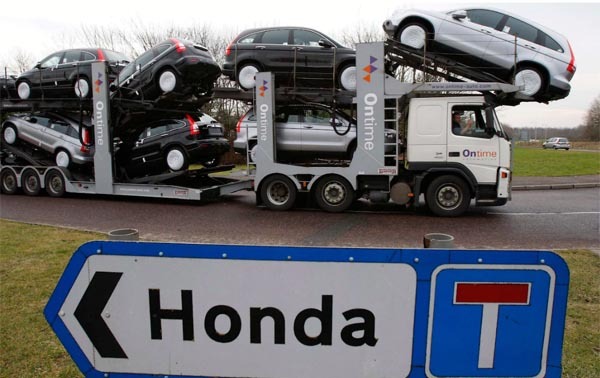 For Honda, all the vehicles manufactured at its Swindon plant – with a huge proportion exported to Europe – are approved by the VCA which means that, post-Brexit, their products will no longer be cleared for sale in EU Member States. This will also apply to all other vehicles approved in the UK, effectively bringing export sales to a complete halt, until such time as the vehicles can be submitted to an EU Member State approval authority, and gain new certification. And that won't be easy or quick. Not helping his cause, Keating actually put this in a rather diffident way. This doubtless served to persuade the media not to raise the alarm. Rather than say outright that approvals would no longer be valid, bringing the industry to a halt, he told the Committee: "we're picking up from the Commission is that type approvals issued by the VCA, the UK Vehicle Certification Authority, will either no longer hold validity or not be able to be extended. So we need to find a way to bridge that gap". This, to my mind, was an odd way of putting it - and very weak, lacking the necessary emphasis. My immediate thought was that he should not need the Commission to tell him what is happening to the industry. He should be able to look up the law and work it out for himself. And that would have told him that there was no way of bridging the gap. It should have told him that a huge crisis faced the industry. The problem for Keating (and us all) though, is that we don't know exactly what the law will be in 2019. The current law is undergoing revision and is, at the moment, going through the European Parliament. Most likely, the proposed regulation will be in force by the time we Brexit but, at this stage, we cannot be absolutely certain that all the details currently in the draft will apply. However, this is only a detail. It is almost certain that the UK, having acquired "third country" status by virtue of having left the Single Market, will have to submit its products for type approval again, before they can be sold. There will be no recognition of third country approvals. Here, the legislation mirrors the REACH regulation, with third country manufacturers each having to appoint a "single representative established within the Union to represent the manufacturer before the approval authority". Additionally, the manufacturer has to appoint a single representative established within the Union for the purposes of market surveillance. These can be the same representatives appointed for the purposes of EU type-approval. Interestingly, I have written about this before and it is no exaggeration to say that the issues are complicated. Specifically, though, I wrote in the context of the EU-Korea trade agreement, suggesting that any deal settled between the EU and the UK might look very much like this agreement. Sure enough, when you read the small-print of that agreement (Annex 2-C), Korean motor manufacturers are still required to submit their products for type approval to an approval authority in an EU Member State, before they can be sold. Additionally, the Koreans have to maintain absolute conformity with EU/UN regulations, including the adoption of new regulations as they are come into force. In yesterday's evidence to the committee, Keating suggested that one possible way out was for the industry "to work with the UK government to make sure there's mutual recognition of any approvals issued by the UK government". He had, however, already conceded, that even products imported from Japan were submitted for type approval in Belgium. Since the most comprehensive trade deal with a major car manufacturer also requires it to seek local type approval, the chances of the UK securing a mutual recognition agreement are nil. There is not the remotest possibility that the EU will accept mutual recognition of type approvals. The best one can hope for is a temporary agreement to tide us over any transitional period. Deal or no deal, in the longer term, UK type approvals will no longer be valid in EU Member States. What we got out of this, in terms of reporting, was the Guardian which stated that Aston Martin (after evidence from Mark Wilson, Chief Financial Officer) also feared a "semi-catastrophic" end to EU recognition of UK regulatory approval, something – the paper reported – "Keating revealed Brussels was now threatening in the event of a 'no-deal' Brexit". There, in black and white, is the erroneous reference to the "no deal" scenario. But Keating had addressed his remarks to the situation prevailing when we leave the Single Market. And Brussels wasn't threatening. This is simply the inevitable consequence of leaving the Single Market. Once again, the media seems incapable of coming to terms with the consequences of the UK's status as a third country. The point Mike Hawes (Chief Executive, Society for Motor Manufacturers and Traders) then made, after Keating had delivered his unrecognised bombshell, was that manufacturers could not apply for type approval while actually manufacturing so they would have to cease production while they re-applied. Then, any new approval would have to take account of any changes to the regulations, which could create significant problems. Conformity might not even be possible. But either way, new approvals are not automatic. They will take months and be costly to gain. What the likes of The Times published, though, was Mike Hawes saying that "every car maker would need clarity by the end of this year if they were to plan for what Brexit would mean from March 2019". At issue, the paper has them saying, "was the need for a deal on the certification of British-made vehicles to have equivalence or the same recognition as models in the EU certified in Brussels". This is a travesty of what transpired, an incredibly weak rendition. In the actual evidence session, Wilson said his company would have have to stop production if there wasn't a carry over of type approval. This, he said, was "semi-catastrophic". It was then that the semi-intelligent Rachel Reeves chose to see this in terms of a "no deal", failing to pick up the reference to leaving the Single Market. But Wilson then reiterated that the consequence of having type approvals lapsing would be that production would cease - the result of leaving the Single Market. Let that sink in: leave the Single Market and production would cease. Neither Reeves nor the media understood that. The confusion, perpetrated partly by Reeves and partially by the lack of clarity from the industry itself, meant that the prospect of this catastrophic situation failed to have the impact that it should have had. The media should have looked past the fluff, but it didn't. Unless stories are handed to the journalists gift-wrapped, they have no ability to report what they hear. Nevertheless, the industry isn't doing itself any favours. It still thinks hopes that there will be a solution. With that, there is almost a child-like faith in a near-mystical "transition" giving some sort of relief, without anyone being able to say precisely what is involved. Indeed, no one seems to have the first idea of what is involved or what we can expect from it. Unicorns have more substance. With less than a year to run before the substantive talks must be completed, and trade issues not even having been discussed, this has the car industry in an impossible position – and all the more so because of the confusion and obfuscation, where the industry itself seems reluctant to confront its own fate. Instead of raising the alarm, it is hedging its bets. Whichever way you cut it, though, the future does not look bright. But then, when it goes belly-up, the media will be the last to realise.